Face it: you love your application. You’ve spent weeks and months meticulously coding it and you LOVE it, just the way it is. You want to run it in the cloud and you certainly don’t want to spend time redesigning it to work with a new cloud database technology or to perform well on the infrastructure of your cloud provider. When it comes to databases, we all know that performance matters. You want your application to run fast, really fast. How fast? How about 229 percent faster? Intrigued? Please read on. During the past few weeks, we have been running initial performance tests on our service and want you to understand how our metrics look, especially when compared to Amazon RDS. Rather than simply telling you how fast we think the service is, we think its best to just show you what we did. First, let us give you a little bit of background on the test process itself. We used SysBench, which many of you know is a popular tool for evaluating system and database performance for MySQL. SysBench has several test modes, including CPU, threads, memory, File I/O, OLTP, etc. We used the OLTP test mode, which was written to benchmark the performance of a database under transactional loads. The test involved point value queries, ranges, SUM(), ORDER BY, UPDATEs, DELETEs, INSERTs, etc. In other words, it tries to emulate the type of workloads your applications are currently handling. Second, we tried to create two environments that are as close to each other as possible in Amazon RDS and Rackspace Cloud Databases to make sure we were as close to an apples to apples comparison in our test; putting special emphasis on dedicated system memory and compute power. We selected the Amazon RDS Small with 1.7 GB configuration and our Rackspace Cloud Databases with 2 GB configuration, and verified that in our tests we did not use more than 1.5 GB of memory. We turned binary logging ON for the Rackspace Cloud Databases environment, and selected a ratio of 75 / 25 for the read / write mix in the basic OLTP workload of SysBench. We also attempted to create a production-like environment for Rackspace Cloud Databases, simulating 100 percent CPU contention on the host and simulating disk I/O contention using standard I/O generation tools. We ran the tests for about an hour on each system. We were pleased but not surprised when we saw that SysBench reported that Rackspace Cloud Databases performed 229 percent faster than Amazon RDS. As we told you from day one, everything we have been doing here has been focused on designing a service specifically for high performance and high availability in the cloud, from the way we virtualize our service to the way we designed the storage for it. 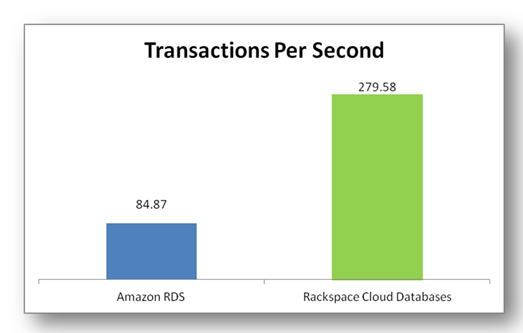 See the chart below, where you see RDS with 84.87 transactions per second (tps), and Rackspace Cloud Databases with 279.58 tps. This is only the beginning. You should expect more performance test results in the near future. In the mean time, sign up for our Early Access Program now. Beat Amazon 229% on price and I’ll consider switching. I’m looking forward to creating an instance from the control panel 😉 Any word on the pricing? Support in the control panel is coming soon! We’re not quite ready to announce pricing, but we will once the product goes into unlimited availability. Our plan is to focus on making a great experience around MySQL first, but the architecture and system could definitely support other database offerings. We’ll definitely evaluate that in the future. This is great! I’ve been using it for a few days, I’m so impressed that I’ve written a mini guide for anyone wanting to move their SQL database to Rackspaces Cloud, guide is here http://www.bybe.net/blog/how-to-use-rackspaces-sql-cloud-databases.html enjoy, and Rackspace keep up the superb work! Great work on the write up! We’re working really hard to make a world class product. Glad to see you’re enjoying using it. I experimented with the Cloud Database. Performance was excellent. Price, not so much. For some, it will be just the ticket. For me, an extra $50 a month is too much for improved database performance. It’s a shame. Glad you have enjoyed Cloud Databases outstanding performance. We are working hard this year to add features, improve ease of use, and decrease total cost of ownership of the service. You didnt test PIOPS? just standard RDS? Run the test again and let us know the results with PIOPS enabled. Quick Question though, you didn’t mention performance against Amazon’s RDS with provisioned IOPS. They just announced up to 30000 IOPS and it seems these benchmarks you did were on the standard IOPS. Can you do one of Rackspace Cloud DB vs the best Amazon has. I’d like to see that for a great comparison.